Sheriff Victor Hill’s Joint Operation “Shadow Of Bat” Results In 18 Suspects Arrested Today! Clayton County Police, Riverdale Police, and the Clayton County Sheriff’s Office teamed up today to execute Sheriff Victor Hill’s operation “Shadow Of The Bat”. 18 wanted suspects were located and taken into custody today. One of the wanted suspects was not home when Officers and Deputies came looking for him today on Mt. 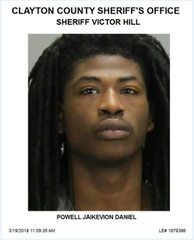 Zion Rd, but his friend Jaikevion Powell was house sitting while selling marijuana. Realizing that Officers and Deputies were not going to buy weed from him, Powell decided to try out his track skills, but soon found out why he did not make the team. 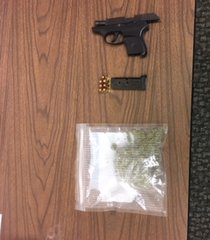 Powell was also in possession of a firearm that was seized along with the drugs. Powell is now facing the wall at Georgia’s toughest para-military jail, and his friend whom he was house sitting for still has reservations to come stay at the luxurious “Hill ton”.